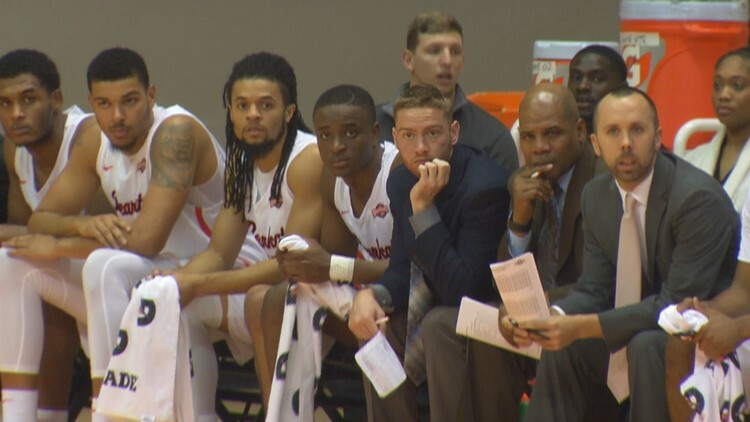 The Sam Houston State men's basketball team (3-7) held a late lead, but the crew couldn't hold on as the Bearkats dropped a 71-65 decision at Colorado State, Saturday afternoon at Moby Arena. The Sam Houston State men’s basketball team (3-7) held a late lead, but the crew couldn’t hold on as the Bearkats dropped a 71-65 decision at Colorado State, Saturday afternoon at Moby Arena. Chad Bowie led the Bearkats with 14 points in a 6-for-9 effort from the field. He was joined in double figures by Josh Delaney (12 points), Cameron Delaney (10 points) and Bubba Furlong (10 points). The Bearkats went 7-for-10 from the free throw line while Colorado State hit 22 free throws. After Bowie hit his first field goal of the day to make it an even 4-4 game, Kai Mitchell stole the ball and connected with Bowie under the basket to give the Bearkats their first lead of the game, 6-4. Following the lead change, the Rams used eight-straight points to take a three-possession lead. However, highlighted by five points from Bubba Furlong and a trey from Bowie, the Bearkats responded with 10 unanswered points to make it a 16-12 game nearing the 11-minute mark. Sam Houston prevented a Colorado State field goal for four full minutes before Nico Carvacho broke up the Bearkats’ run with a layup. Furlong responded with a layup of his own and also answered a Ram three-pointer with his first trey of the season. Interrupted by two Carvacho free throws, Sam Houston went on a 12-2 run to go up, 33-22, after Adam Thistlewood hit the Rams’ third shot from beyond the three-point arc. Colorado State didn’t knock down another field goal for nearly four minutes before J.D. Paige sparked a nine-point run to pull within two points of the Bearkats. Zach Nutall drained Sam Houston’s fifth trey of the game to add some separation and the Bearkats held a 36-33 lead heading into the intermission. Bowie and Josh Delaney each nailed a three-pointer to start the second half. After a play under the basket resulted in a technical foul on Carvacho, Delaney sunk two free throws and drove to the hole on the following play to put the Bearkats up, 48-39. As Sam Houston led 54-50 with just under seven minutes to go, the Rams reclaimed the lead thanks to 10 straight points over a span of three minutes. Nutall broke up the momentum and brought the Bearkats within three points with a shot beyond the three-point line, but a jumper by Paige and two Carvacho free throws gave the Rams a 64-57 advantage with two minutes remaining. Field goals from Mitchell and Cameron Delaney cut Colorado State’s lead down to two points with a minute and a half remaining, but five straight Ram free throws added untimely separation from Sam Houston. Josh Delaney drilled a three-pointer with seven seconds remaining, but two final Ram free throws sealed the 71-65 decision. With the loss, the Bearkats fall to 3-7 on the season. Sam Houston averaged 36.4 percent from the field and Furlong led the squad with seven rebounds. The Bearkats return home to Johnson Coliseum on Tuesday, Dec. 18, for a 6:30 p.m. matchup against Alabama State. For all the latest information on the Sam Houston State men’s basketball team, visit gobearkats.com or follow @BearkatsMBB on Twitter.